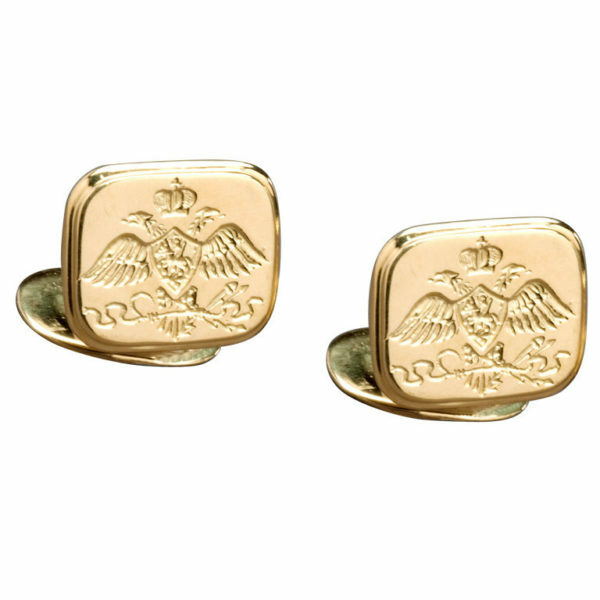 Solid 18k gold links engraved with the Russian imperial eagle in the Neoclassical version made famous by Tsar Nicholas I (1825-55). Based on a European 19th century cufflink design, the polished rectangular links feature rounded corners and beveled borders, the double-headed eagles with downturned wings, each below a single Romanov crown, the Shield of Saint George slaying the Dragon (the arms of Moscow) on its breast. The top links are attached by a fixed curved section to smaller oval back links that flip down to slip easily into the cuff. Designed by Marie E. Betteley, 2006. This ideal gift is sold together with a cufflink box, custom suede travel pouch from Italy and an embossed card with full description.